For obvious reasons, during the past few months there weren’t as many plectrum updates as used to be, but then in July something popped up on a certain Instagram account. Per Gessle posted a picture of a guitar pick saying ”New guitar pick, flipside!”. We all started wondering what the text (What’s been played with this pick stays with this pick) and sealed-lips emoji on the plectrum could refer to and it didn’t last too long to find out it had surely been produced for private gigs. We had to wait 2 months to see where the pick was used and it turned out it was the only occasion Per played it. It happened at a birthday party at A.b.b.e.y. R.o.a.d. S.t.u.d.i.o.s. Wow! It must have been an awesome feeling to play at such a historical & magical place. What the pick (1; 2) says is not completely true though. Of course we don’t know the full setlist, but we know the band played The Look and more importantly, they also played Här kommer alla känslorna (på en och samma gång). Huh? Who would have thought that Per would EVER play THIS song at THAT place? Yep, it was a Swedish business man’s birthday party after all, but still! It’s just amazing! 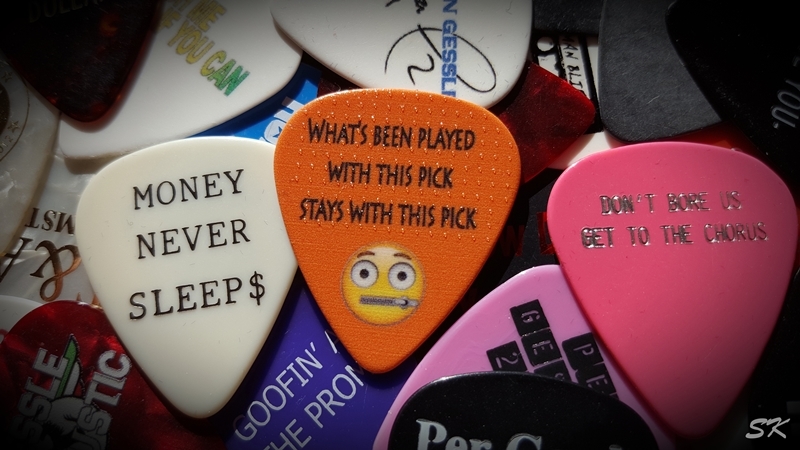 Fortunately, Mr. G was generous enough to share the pick with the greatest plec collector among Roxers, Sandra Knospe and this way the PLECtionary could be updated. Woohoo! Check it out! I remember that Per mentioned in the interview about the guitar picks, that he considers it a mission to help me find Plectrum-Nirvana. And I also remember how shocked (in a positive way) I was when I read this back then. That alone was more than I ever could wish for. Of course I didn’t dare to believe that he actually would make it true. But he really did. More than just once. And I still can’t believe it. I am so happy and grateful that he helps me to keep the collection complete. And it also makes things so much easier. It sometimes is like pulling teeth if you try to swap a missing pick with somebody, esp. such rare ones that have not even been played at public events. So thank you again, Per, for being such a kind person and also for making the hunt much easier. I can’t find the right words to explain good enough how much I appreciate that. But I so do!!! Huge thanks again for the updates, Sandra and much appreciation to Mr. G for making it possible!